It's just another bathtime for this giant, gentle mammal. 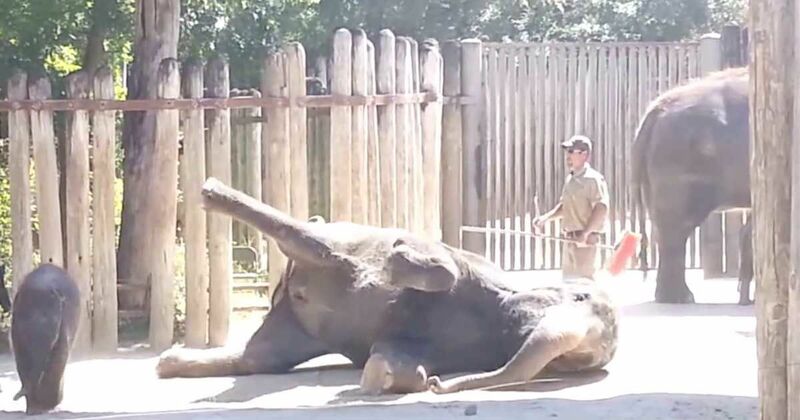 But, visitors at the Fort Worth, Texas Zoo, were treated to an extra special show when one of the elephants takes the brush from a keeper and does the job himself! From the video below, this doesn't look like a new trick for this elephant. He knows exactly how to do the job. The Fort Worth Zoo is home to three generations of elephants (a total of 7) including younger elephants born in August of 2013. The elephants were featured on the Emmy-Award winning nature show entitled Wild Kingdom, in May of 2014 according to the Fort Worth Zoo's website. Asian Elephants enjoy being clean. They bathe themselves every day by taking water in their trunk and spraying it all over their body, according to Twycross Zoo. Sometimes these beautiful animals even enjoy a mud bath. While the astute handling of the broom is surprising, this elephant's actions align with their natural desire to keep clean. What's the craziest thing you've ever seen happen at the zoo? Share your thoughts in the comments below.